*Valid January 1st, 2019 through July 31st, 2019 for first time patients only. If you have one or more missing teeth, dental implants and their restorations can restore the full function and aesthetics of your smile. Dr. Stephen R. Ho is dedicated to providing quality dental implant treatments in Honolulu. Utilizing aesthetic materials and products crafted in the United States, patients leave our practice with permanent teeth replacements. Ready for a brand new smile? 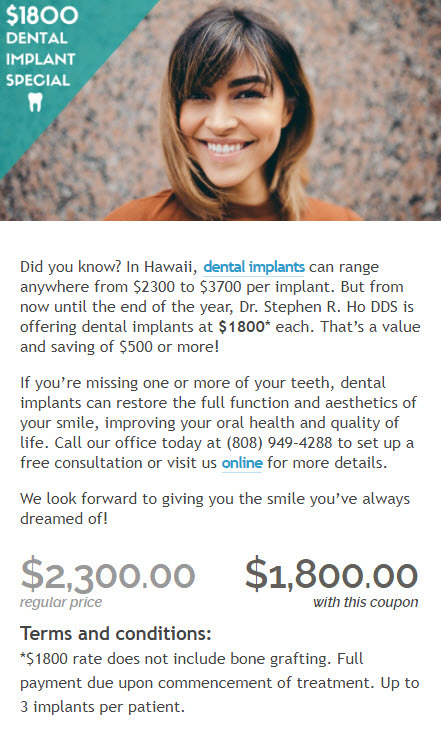 Contact your Waikiki dental implant provider today! Dentures are removable and are retained in the smile with adhesives or suction, but over time dentures can become ill-fitting. At our Waikiki dental implant practice, we affix dentures to implants for a reliable fit and stable function. No longer will you have to worry about your prosthetics falling out; smile with confidence with implant-retained dentures. Missing teeth in the smile impacts the integrity of your jaw bone density. Tooth roots act as support for the bone to fuse to. With missing roots, the jaw bone begins to deteriorate, resulting in a pre-maturely aged appearance. 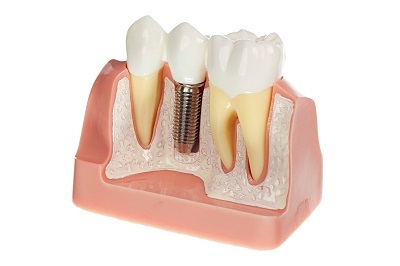 Dental implant posts replace the missing tooth roots, allowing for renewed jaw bone to integrate and regain density. Qualifying candidates for dental implant placement require adequate bone density and proper soft tissue health. However, at our Honolulu dental practice, we provide mini dental implants for patients with less bone mass but desire a reliable solution to missing full arches of teeth. Dr. Ho uses Nobel BioCare, Biomet 3i, Hiossen, and Ankylos implants, which are renowned for their performance and durability. Our restorations are fabricated to look and feel natural in the smile, and can be restored if ever needed. Whether you’re missing one or a full arch of teeth, dental implants by our Waikiki dentist can make all the difference in your smile. We can extract teeth, place dental implants, and provide bone grafting procedures in office. Dr. Ho and his team are dedicated to providing the best treatment possible to replace missing teeth. Once the implants have been placed into the jaw, we allow time for healing and integration before placing the final prosthetic to complete treatment. Our dental implants are designed to offer superior performance for many years. Contact our Honolulu Dental Implant Practice Today! Dental implants are an investment in better oral health, a more beautiful smile, and an improved quality of life. If you have any questions, or would like to schedule an implant consultation, contact Dr. Stephen R. Ho and his experienced staff today!